Good customer service is a pet peeve of mine. Recently, I wanted to order some pajamas with feet for my wife for Christmas. The company's website was out of stock, in her size, in early December so I wrote to them asking when they'd expect more. Three weeks later (between Christmas and New Year's) they responded and told me to keep checking the website. Fast forward to February when their inventory levels on their website hadn't changed at all - I'd been checking about every 10 days. I e-mailed their customer service department again asking about their inventory and the response I got was that they were working to increase their inventory levels over the next few weeks. I can actually answer this quite quickly - we don't expect to run another production on the penguin print until late summer to be available for fall. I think they just lost a customer for life. Today, I experienced unexpectedly great customer service at a tea shop in San Clemente called the Lavender Lounge Tea Company. The shop is located off the beaten path, above a 31 Flavors. When it opened, about eight years ago, I thought that it would soon go out of business due to its location. I lived on this street from '94-'98 and had seen many businesses come and go. Today I found out why it's still around. When my wife and I arrived there were about five patrons that were just leaving so we had the place to ourselves - along with what looked to be about a hundred different kinds of tea. The only employee was a young woman (early 20s) who we asked for some recommendations. She wasn't the owner, but she clearly knew her teas. I am not a tea person and I'm not a coffee connoisseur either - by the time I've prepped my coffee it has sugar, syrup, and cream. I ended up having the Ruby Cocoa Kiss tea (would a tea aficionado tell me that this wasn't "real" tea?). This tea was good - very good - and I didn't need to add anything to it which is a first. It was so good I bought a tin of Ruby Cocoa Kiss tea as I listen to the employee explain some differences in teas. 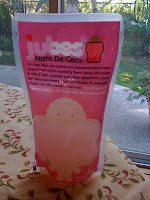 As I was being rung up, I saw a coconut meat cubes dessert, from Indonesia, that I had never heard of before called Jubes Nata De Coco. When I asked her about the dessert I was impressed that she knew all about it and how it compared to boba (pearl), but, what impressed me the most was that she told my wife and I that we should visit the Jubes website. She told us how cute the website was because you had to put the cubes into the Jubes mascots' mouth to navigate from webpage to webpage. No, this wasn't a Starbucks barista who only knew how to make coffee according to an operations manual - she obviously was well trained in most every aspect of the business. 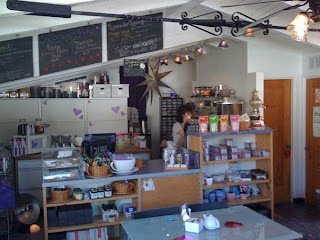 It turns out that all of the Lavender Lounge Tea Company's employees are "students of tea".